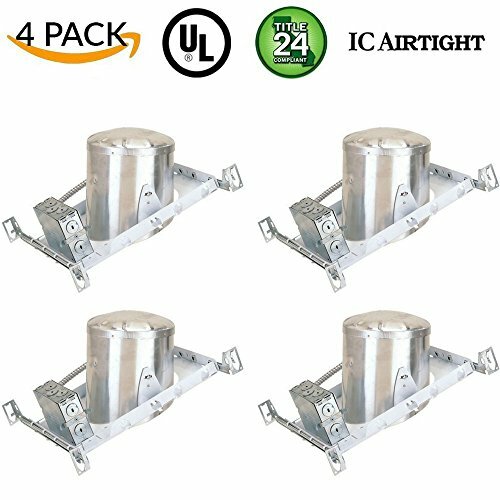 Four Bros Lighting - Recessed Lighting - For Slope New Construction Applications - E26 Base Only - IC Housing - Air Tight - 120V - For use in Insulated Ceilings Use this 6 Inch Slope New Construction can lighting with new construction applications where you have an open ceiling. This 6" recessed pot light sports an adjustable hanger bars that will surely fit between any 2 joists for easy installation. Housing is made of Die-Cast Aluminum and is IC and Air Tight Rated for optimal results. This 6 in. new construction recessed light is preinstalled with an LED quick connector that is compatible with almost all LED downlights.